These "homemade" ear plugs do solve the problems associated with professional lab custom molded ear plugs: DIY custom molded ear plugs are inexpensive, they have a much faster turn-around time, and they can be ready to use the same day they arrive in the mail. However, all that instant gratification comes at a price. DIY custom molded ear plugs are made of lower-quality material than their lab molded counterparts.. and of course, you make them yourself, rather than having them made for you by a custom mold professional at a lab. As a result, DIY custom molded ear plugs may not fit as well or block noise nearly as reliably as the professional lab versions. With DIY custom plugs, what you make is what you get. (NRR 26) E.A.R. Inc. Do It Yourself Custom Ear Plug Kit is a terrific compromise solution when you want or need custom fitted ear plugs, but you are not ready to fork over more than $100 to get them! (NRR 31) Decibullz use thermoplastic material with no putty to mix, which means no mess and less stress. Decibullz are the only DIY custom earplugs you can re-do until you get it right! Decibullz custom earplugs are clean, quick, easy, and attractive. Available in red, black, blue, pink, and orange. 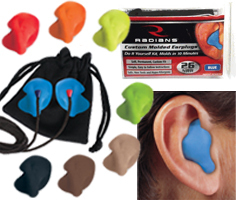 (NRR 31) Decibullz Percussive Shooting Filters are DIY custom molded ear plugs designed for hunters and shooters. Molding is easy and takes five minutes. Percussive filters suppress incoming blast noise to safe levels, defending your hearing. No batteries required. Takes 5 minutes to make. (SNR 22) ZenPlugs are custom molded ear plugs that you can mold to fit your ears in your own home in about fifteen minutes. The process is extremely easy. Unlike most other DIY ear plugs, ZenPlugs are completely re-moldable, so you can try again if you don't like the fit the first time. (NRR 28) SonoLab V5 instant fit custom molded ear plugs are made using a single use forming device. Carefully following the included instructions, you put the molding device on your head, seat the ear pieces in your ears, activate the molding device on each side, wait 6 minutes for the material to set up, remove the earplugs from the forming device, snap on the covers and you are done. Your custom molded ear plugs are immediately ready for use. Custom ear plug accessories help you get the most out of your custom molded ear plugs. The ear plug lubricants here can make many types of ear plugs much more comfortable. Other products you will find here include ear plug lanyards, replacement filters for various custom musicians ear plugs, and more.